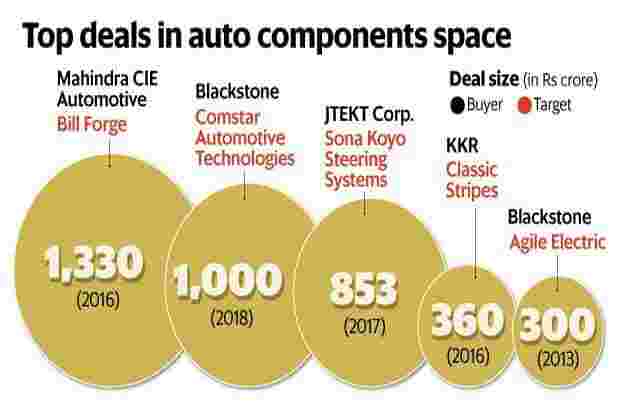 Mumbai: Private equity fund Kedaara Capital Investment Managers Ltd is in final stages of discussions to acquire Rajasthan-based auto component maker Sunbeam Auto Ltd for $100 million (Rs650 crore), two people aware of the development said. The Munjal family-owned Sunbeam designs, manufactures and sells automotive aluminium die casting components. A leading supplier to the automobile industry in India and globally, its customers include Hero MotoCorp Ltd, Maruti Suzuki India Ltd, Sona Koyo Steering Sytems Ltd, Daimler Chrysler AG of Germany, Robert Bosch Corp. and Continental Automotive Systems. In 2010, the Munjals of the Hero group divided their business empire among the families of the four patriarchs—Brijmohan Lall Munjal, Om Prakash Munjal, Satyanand Munjal and the late Dayanand Munjal. Ashok Munjal, son of Dayanand Munjal, the eldest in the first generation, got Sunbeam Auto and currently serves as the managing director. EY India is advising Sunbeam Auto’s management on the sale. Emails sent to spokespersons at Sunbeam Auto, EY and Kedaara Capital were not answered. Set up in 1986 to make aluminium die cast components for the two-wheeler industry, Sunbeam diversified into the four-wheeler segment in association with Maruti Udyog Ltd (now Maruti Suzuki India Ltd) in 1994. If the deal materializes, this would be Kedaara’s second investment in an auto parts maker. Kedaara used to own Bill Forge, and sold it to Mahindra CIE Automotive for Rs1,330 crore in a cash and stock deal in 2016. The domestic auto component industry is expected to post a growth of 9%-11% for FY18, led by demand from passenger vehicle and two wheeler makers, said a December 2017 note by Icra Ltd.
“Auto component as a sector is witnessing a lot of activity in the past couple of years after a slump witnessed in years before that," said Nitish Poddar, partner and national leader of private equity at KPMG India. There is more and more financial sponsor interest in auto components now and is largely driven by more attractive valuations, export potential, global reach of Indian auto comp manufacturers and strong demographics in the domestic market, he added. Anticipating the higher growth in automobile industry, private equity firms are actively pursuing investment opportunities. US fund Blackstone has acquired Chennai-based Comstar Automotive Technologies for Rs1,000 crore. Kedaara was founded in 2011 by former Temasek Holdings Pte India head Manish Kejriwal, along with Sunish Sharma and Nishant Sharma, who were managing director and principal respectively of global private equity firm General Atlantic in India. The firm raised its debut fund of $540 million in 2013 and has made major investments in Spandana Sphoorty Financial Ltd, Vedant Fashions (Manyavar), Vijaya Diagnostics, Bill Forge, AU Small Finance Bank and Mahindra Logistics. Last year, Kedaara Capital raised $750 million for its second fund.